Seeing life through the eye's of a painter. Life is precious, it is beautiful and full of wonder. I paint in an attempt to capture that beauty and wonder as I gaze upon creation. In the beginning God Created. He created me to create and so I do. From our recent trip to Milwaukee art museum to see the Bouguereau exhibit. Such a wonderful way to spend the day. A must see show, up until the end of May. I had a fun time working on these commissions over the spring and summer. These two sweet girls are cousins. I had the honor of painting their older cousin two years ago when their grandpa contacted me wanting a commission of their first grand baby. How exciting to be contacted again when two more grandchildren came into the world. We wanted the paintings and drawings to be the same size as the first commission but unique to the individual child. I had a blast traveling to Michigan to do a photo shoot of these girls and decided on gestures that captured their character and personalities. These sets of commissions were unique in that the paintings were to belong to the grandparents but they also wanted to give a special gift to their own children, so they commissioned a small drawing to give to the parents of these cute little ones. 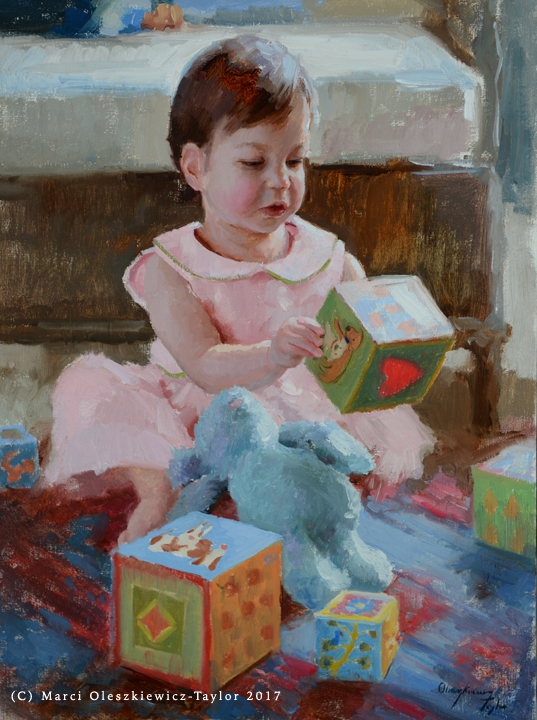 Below was the first commission of my client's first grandchild. It was an honor to be commissioned again when the next two grandchildren came into their family.